Pipetel's Explorer is an un-tethered, modular, remotely controllable, self-powered inspection robot for the visual and non-destructive inspection of 6" and 8" natural gas un-piggable transmission pipelines. The most prominent reasons that render a pipeline un-piggable are flow rates that are lower than needed to propel an in-line inspection tool (pig); the presence of obstacles such as valves, mitered bends, back-to-back in and out-of-plane bends; and the cost and operational complications associated with installation of launching and receiving equipment. Explorer can also be used for distribution pipelines as a pre-inspection technology for other rehabilitation and repair techniques. The Explorer platform uses a Remote Field Eddy Current Sensor (RFEC) which is a non-destructive inspection sensor that uses low frequency alternating current to measure wall thickness for the entire pipe circumference. Explorer also incorporates two fisheye cameras at each end of the robot that provide high quality visual inspection for locating joints, tees and other pipeline appurtenances. As an in-line inspection tool, Explorer is launced operated and retrieved under live conditions and can negotiate diameter changes, bends and tees up to 90° as well as inclined and vertical sections of the pipeline network. Modkit is an in-browser graphical programming environment for microcontrollers. Modkit allows you to program Arduino and Compatible hardware using simple graphical blocks and/or traditional text code. You start by configuring your hardware and then writing programs for that hardware configuration. With Modkit, you are able to configure your hardware graphically. You then snap together graphical code blocks to build programs, in a graphical programming language inside your browser. Finally using the downloadable widget you then send the finished code to your physical device. The Modkit MotoProto Shield for Arduino that makes it easy to connect up to 4 sensors and control two DC motors as well as a 16X2 character LCD. The sensor jacks accept 2.5mm cables and provide access to VCC, GND, and an analog input. Automated Camera Movement and Tracking For Broadcasting. The Camerobot Systems is a robot system for the automated movement of film and studio cameras in live broadcasting and/or VR sets. 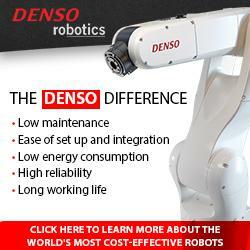 The robot has 7-axis, a range of 4.0 meters in diameter and has a positional accuracy of +/- 0.05 mm. The camera is also capable of object and person tracking, collision avoidance, and movement syncing with virtual environments. The newest episode of the robotics podcast, Flexible Elements, is up now. Host Per Sjöborg interviews Juan Gómez of Robotics Lab about the snake modular robots he is developing. In the Robotics Lab of his modular snakes have acquired new gates (styles of moving) that include rotating, rolling, turning, moving forward and moving backward. Everything is fully open source with full plans available for 3D printing. The audio is available here . With a full synopsis and links from the discussion on Sjöborg's website here.